Republican (Term Expires: 2022) serving Fayette, Somerset and Westmoreland (part) Counties. 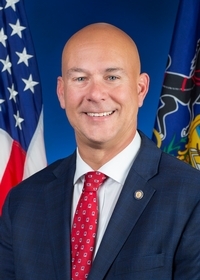 Senator Pat Stefano was elected to represent the 32nd Senatorial District in November of 2014 in his first run for public office. He is a lifelong resident of Fayette County and a third-generation operator of his family’s printing company, Stefano’s Printing. Stefano worked full-time while attending Penn State Fayette, The Eberly Campus, where he earned an Associate Degree in Business Administration. Stefano worked in the family business for the next 30 years, including the last 11 years as owner and operator. His skills managing budgets, controlling costs, and meeting a payroll have provided him with the common sense and real-world experience needed in Harrisburg, PA. A strong supporter of quality education, he has pledged to focus money on students and the classroom and will work to ensure teachers have the tools they need to succeed. Stefano is a founding member of the county’s “Buy Local” Steering Committee, a past President of the Fayette County Chamber of Commerce and a member of the Greater Connellsville and Morgantown Chambers of Commerce. He has worked county-wide serving as a board member of the Fay-Penn Economic Development Council. Pat has dedicated himself to numerous charitable and civic causes in the community. He is a lifetime member and former Board President of the American Heart Association, where he has volunteered for more than 20 years. He has also dedicated his time to Junior Achievement, Rotary Club of Connellsville, YMCA of Laurel Highlands, Downtown Connellsville and Boy Scouts Troop 180. Pat and his wife, Tina, live in Bullskin Township, where they are raising four children.